TEAM FST are the winners of the “2012 TACFIT Fire Fighter 95-Day First Alarm Challenge” with a total compliance score of 8.37 out of 10. The entire team averaged 84% compliance with the program for 95 days. Great work guys! Compliance with the program was based on daily exercise and nutrition on a 10 point scale. Performing the workout as prescribed for the day resulted in 4 points. Training outside of the prescribed intensity resulted in a loss of 2 points. Missing the workout entirely resulted in 0 exercise points. Eating healthy, well balanced meals for the day was worth 6 points. Eating unhealthy meals, drinking alcoholic or high sugar beverages, eating unhealthy desserts, etc. resulted in the loss of one point. A perfect day was worth 10 points. The lowest score for any one day was 0 points. Each athlete participated in the TACFIT Fire Fighter High Intensity Test before beginning the 95-Day First Alarm Challenge. Each athlete was asked to record their average heart rate for the workout, the skill level that was performed, and the number of rounds completed (20 being the highest possible score). Each team member performed the test at a higher skill level after completing the First Alarm program. The average heart rate for each athlete dropped by 6-8 bpm at a higher level of training complexity. An individual must demonstrate improvements in muscular strength/endurance, power, metabolic conditioning and mobility to perform the more advanced exercises with proper technique. These athletes were able to improve their performance while decreasing their metabolic demand. Over the course of the 95 day challenge we all increased the level of sophistication of movement along with decreasing maximum heartrate – a very successful challenge. 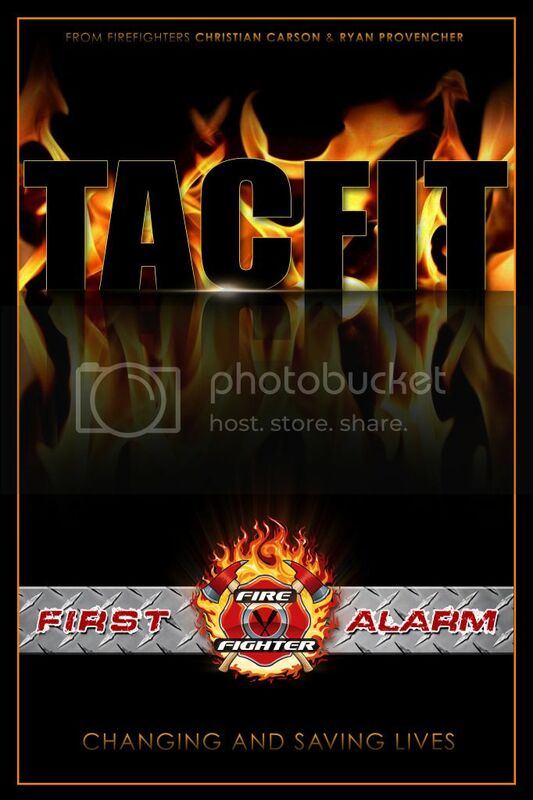 We would like to thank TACFIT Fire Fighter for a very well laid out program. We enjoyed the disks showing the movements when we needed to bump up a level – a great resource. Team FST will receive special edition “TACFIT Fire Fighter Smoke Eater” t-shirts for each team member and a full size “First Alarm” poster for their training facility. Great work guys! If you are interested in starting a “First Alarm Challenge” in your own department or gym, please contact us HERE. This entry was posted	on Tuesday, August 28th, 2012 at 11:32 AM	and is filed under Fire Fighter Fitness, Health and Fitness. You can follow any responses to this entry through the RSS 2.0 feed. You can leave a response, or trackback from your own site.